Steven (Chicagoland, United States) on 14 December 2016 in Architecture and Portfolio. What a happy and confident church this looks to be ! Ce ciel pèr cette église blance le cycliste et vélo sueprbe. Une belle composition et j'aime les vélos devant! Your architecture photos are as good as it gets, without being there in person. From the photo it also looks like the kids like to use it for its vantage point. Wonderful composition nicely framed! A really beautiful church! Brilliant image! The angle and details are superb. Beautiful church. Wonderful color contrast. what a beautiful image with that lovely backdrop! Very beautiful church, and nice shot. It's not easy to take the whole building. Well done. Very beautiful . Splendid framing . An excdllent photo of this beautiful church. The history is a fine addition. A real beauty! I am reminded of a gorgeous old church in Nova Scotia's Acadian shoreline region that is also a historical gem and of wood construction. Fantastic photo of this jewel. D'une blancheur éclatante ! Magnifique construction ! Thanks so much for information!! Excellent detail maintained in the white brightly lit church. THe blue sky might be a bit over-polarized but it provides a drmaatic backdrop. While noticeable, the keyhole distortion is not distracting. A gorgeous piece of architecture. I like the really nice perspective. A nice low angle shot makes it quite dramatic. 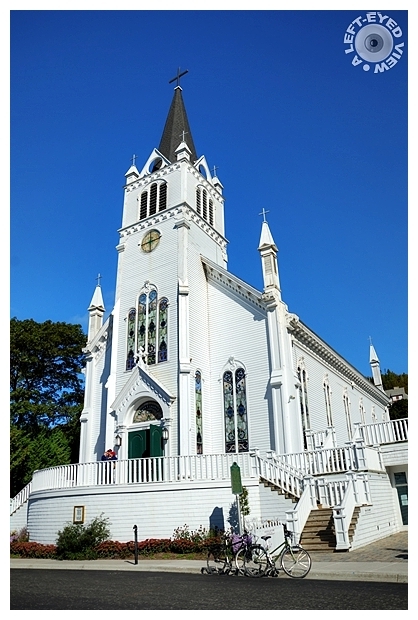 Beautifully composed and the blue sky gave the perfect contrast for the white church.